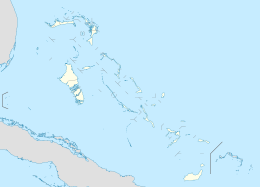 Not to be confused with Lee Stocking Island, also in Exuma. Stocking Island is a small, long, narrow island off the port of Georgetown, Great Exuma Island, Bahamas. The island features beaches and several resorts. Stocking Island is lightly inhabited, with a population of only 10. It is located 1 mile (1.6 km) from Government Dock, Georgetown, across the harbor. The long narrow island protects Georgetown from ocean waves, creating a natural harbor. There is one high hill, known locally as the Beacon, which is capped with an old, unused gas beacon. The glass top portion is missing, but the concrete pillar is visible for miles. The central part of Stocking Island features an inlet known as Hurricane Hole where sailboats anchor for protection during storms, and which features a blue hole. Opposite Hurricane Hole is a sandbar beach called the Spit where locals have built a popular bar/restaurant accessible only by boat known as Chat and Chill. Nearby islands include Lilly Cay, Elizabeth Island, Guana Cay, and Fowl Cay. ^ "STOCKING ISLAND REVIEW". Fodor's. Retrieved 15 July 2014. ^ "Top 5 Things to Do: Exumas, Bahamas". Islands Magazine. Retrieved 15 July 2014.